i’m about as far from a health nut as a person could get (i’m a candy fiend), but i like to think that me and my taste buds don’t discriminate when it comes to food. it can be really good for you or really bad for you, but if it tastes good, we’re down. it might surprise you to hear that lots of healthy foods can also be pretty damn delicious. case in point: kale. kale is soo hot right now, so if you haven’t heard of it, you’ve probably been living under a rock. it’s been lauded on “superfood” lists for the past few years, and comes in many different varieties. a tough, leafy green, kale can be made many ways – sliced in a salad (i once made a meannnn kale caesar), sautéed with garlic, added to sausage and leek soup…the possibilities are endless. lest i bore you by waxing poetic about the many uses of kale, let me tell you about one of my favorite ways to use it: in a pesto. pesto is typically thought of as a basil + cheese + nuts + olive oil sort of deal, but the truth is, you can make pesto from any number of greens, kale included. after “making out like a little bandito” (like my mother loves to say when she gets a good deal) at fairway the other weekend, i took to my kitchen determined to try something different with my kale. 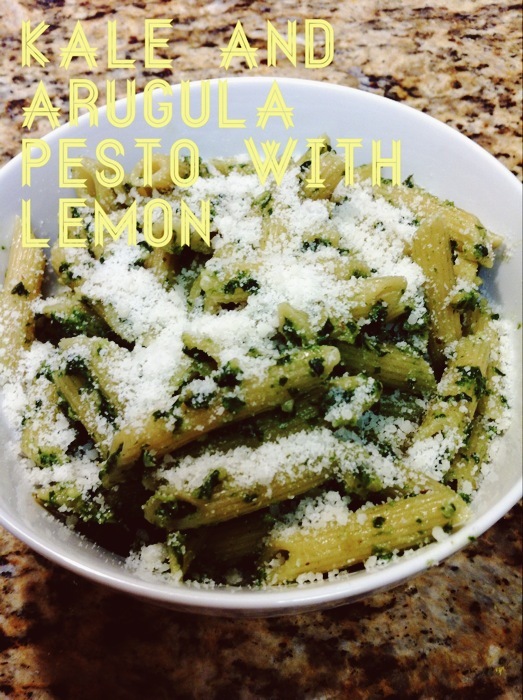 enter: kale and arugula pesto with a splash of lemon. i made this up, but i bet a quick google search would show that i’m not at all original. oh well – great minds think alike, right? since i made it up, my measurements aren’t exactly scientific. but the thing about making pesto is that you have to be willing to stick your finger in there and investigate every so often. taste is everything, and everyone’s taste buds are different. bring a pot of water to boil. blanch your kale – a few minutes should do it. you just want to soften the leaves a little bit; kale can be a bit tough to chew otherwise. while your kale is cooking, chop your garlic and zest your lemon. 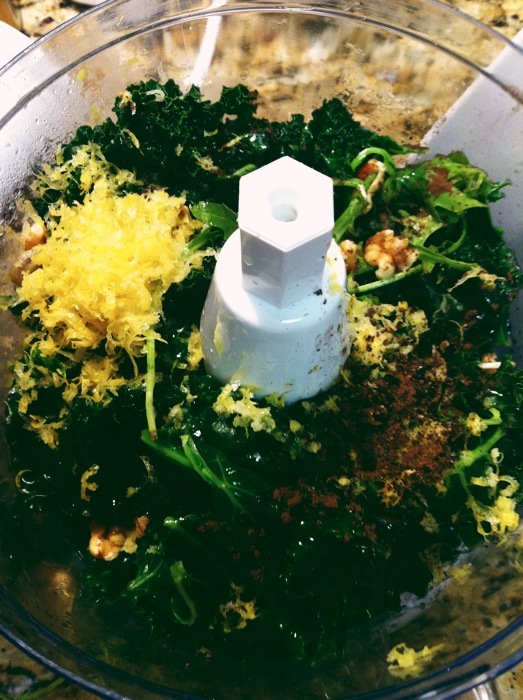 once kale is softened, drain it and dump it into a food processor. 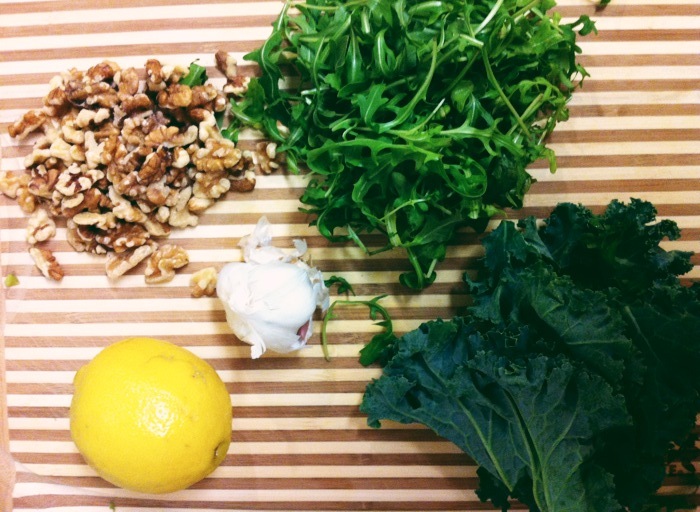 add arugula, olive oil, lemon zest and juice, walnuts, parm and 1 tsp of nutmeg. blend. it’ll take a few minutes, but it’ll all start to come together, and you’ll know if you need to drizzle in a bit more olive oil. some people like their pesto super creamy, others don’t. once things have settled, stick your finger in and do a taste test. if you’d like, add more nutmeg, and then season with salt and pepper. you could also add more nuts or more cheese if you’d like. more cheese is always a good idea, in my opinion. serve with freshly cooked pasta (and fresh pasta, if you’ve got it). then, stick the leftovers in a ball jar and refrigerate. pesto should keep about a week in the fridge; you can freeze it for long term use.